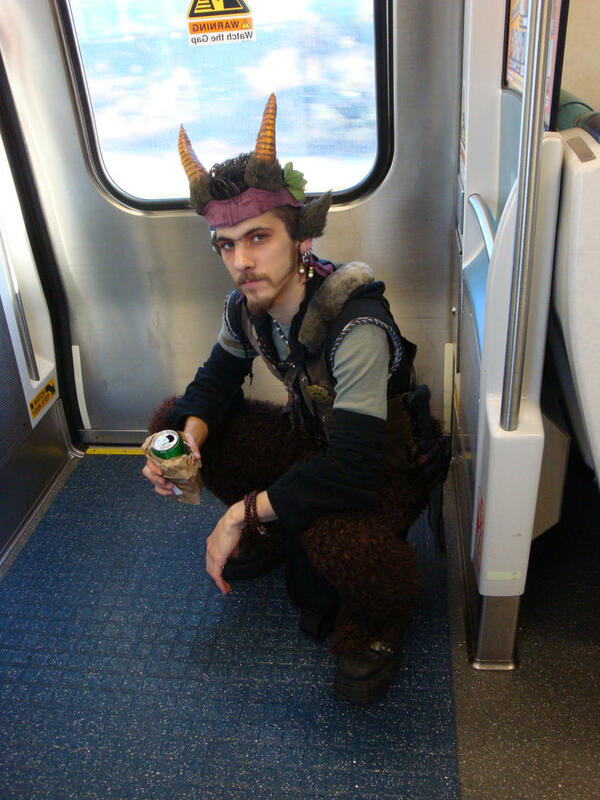 As I mentioned in my last post, my brother and I are planning on making a satyr/faun (both words and interchangeable) costume for him. This would be much easier if I were a witch. I could just sacrifice a couple of goat-virgins at midnight, direct some negative energy or somesuch, and bam, my brother turns into a satyr every full moon. ﻿﻿﻿﻿Instead I will be doing some sewing and sculpting. It's pretty tricky since there aren't any actual sewing patterns of one to be found anywhere, and I want to be a good quality. Some of the most simplistic just have furry pants but both me and my brother want to have something that actually creates the illusion of the shape of the goat (deer?) legs, called digitigrade. Even trickier than that, though, will be the hooves, I'm betting. 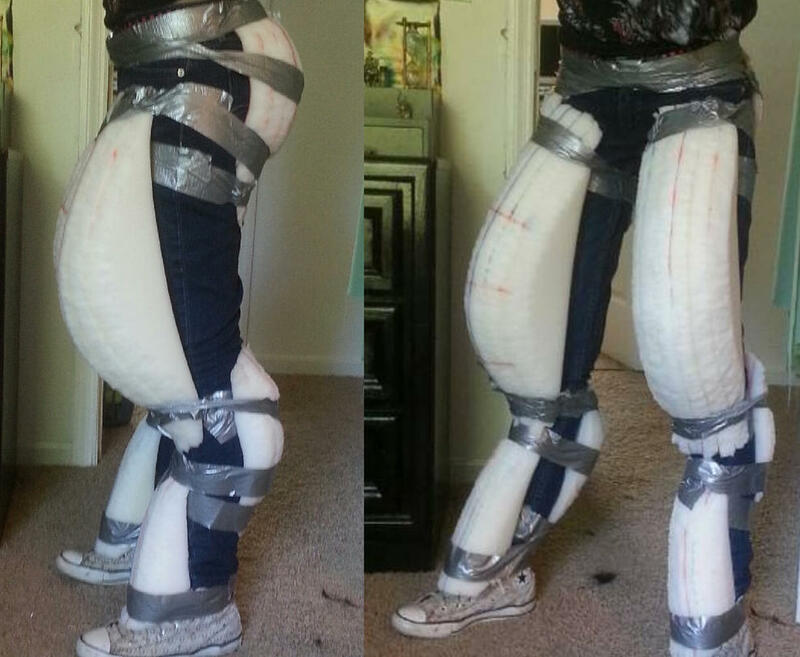 ﻿﻿﻿﻿﻿﻿﻿﻿﻿﻿﻿﻿We've been looking at some people's works online, and so far the best ones use foam to create the digitigrade. Most satyr costumes involve high-heels with the heels cut off. I have no idea how women walk in high heels, much less high heels with the heels cut off. A friend's sister of mine went as Betty Crocker one year with heels on and only managed to walk about a quarter of a block before taking them off and going barefoot. Like a culinary hobo. For my costumes I like to make things not only functional, but comfortable. All of my cloaks are heavy-grade fabric, and when you put one on, you feel it resting on your shoulders. The first cloak I made I was about ten years old, and when I put it on I had an "oof" feeling until I was about sixteen. I say all of this because running around in heel-less shoes is not only uncomfortable and illogical, it's also downright silly (plus no self-respecting man would ever run around in heels...except maybe Tim Curry) As such, I will be attempting to make a flat-heeled version because when people wear costumes they're generally at parties or conventions, both of which involve a lot of walking and I suspect not a lot of ladies keep that in mind when they design their satyr feet. Anyway, for my own project I'm keeping it pretty simple at the moment. I have to quash down the dreams of doe-skin vests and other accessories until I complete the primary part: The legs and feet. Generally the feet (hooves) are separate from the legs. While I had initially suspected the feet would be the most complex, I'm starting to suspect the digitigrade of the legs will be harder, and since I only have the materials for the feet at the moment, that's what I'm going to do first. Every single tutorial I've seen have the hooves built into a pair of shoes, either nailed, glued, or stapled into place, but the problem is that Dex (my brother) is really picky about shoes, so I was thinking about trying to design hooves that can slip onto various pairs of shoes. This link has the best one that I will probably be basing the hooves off of. I have some plain, brown clay that air dries, rather than having to be fired in a kiln or something (I honestly have no idea what the hell I'm doing, I've never sculpted before and I think I last had Play-Doh in my hand when I was six). Once it's dry I will probably use some paint to add a hoof-like color and texture, then varnish the crap out of it, and glue on some fur. Doesn't sound so bad, in theory, right? The problem I'm having is what to have as the structure that I'm going to slap the clay on. One tutorial suggests wire mesh, but I think my parents would be fairly upset if I started slicing through our window screens. Instead I am leaning more towards a plastic base, and will probably sand it to allow the clay to adhere to it better. If it still falls off, glue has been my best friend for many years (super glue has been my fingers' worst enemy, however.) After that figuring out how to allow them to attach to any pair of shoes should be easy. I'm thinking of something like a strap with a buckle, or Velcro. After that I'll be working on the legs (pants). We have some foam, but I'm mostly working with what we have laying around the house. I'm hesitant about the legs because faux fur is really expensive, I have no pattern, and I will only have one chance to do this right. At the moment I don't even have any fur, so I plan to build the digitigrade structure and then probably get the fur. My base will be a pair of self-titled "lounge pants." They've never been worn because they're a rather dubious shade of green. Only after all of that has been accomplished can I dream of doe-skin vests and other accessories. For those of you looking to make a costume of your own I highly recommend The Digitigrade and The Legs postings.